All Bust Quarter values begin at $49. If your coin is dated 1828 or before the minimum value rises to $105. The news is even better for the earlier Draped Bust quarters minted 1804-1807. In "Good" condition they are eagerly sought and your coin is worth $275 and higher. These are values for coins in the heavily worn condition dealers and collectors call "Good". Find a better condition coin in your group or one of the rarer dates and the value climbs dramatically. An 1807 Bust Half in slightly better than "Good" condition becomes a $439 rare coin. Should you have an "Uncirculated" coin the prices rise dramatically. The nice uncirculated Bust Quarter pictured is easily valued over $2,715. Rarity, eye appeal and a high state of preservation are what dealers and collectors seek and are willing to pay for. 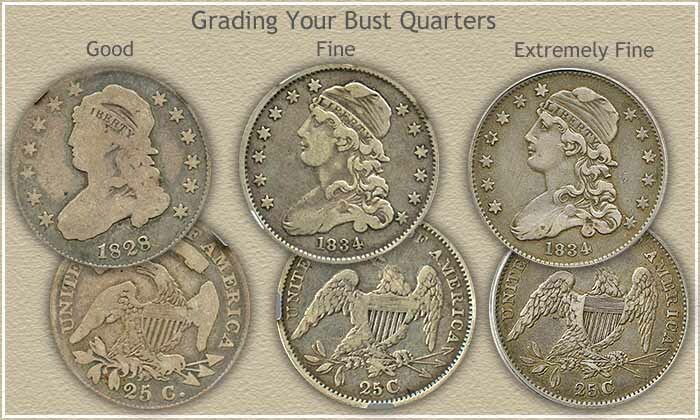 See below for more about how to grade your coins and how it affects Bust quarter values. Wholesale quarter values listed. Notice with the exception of a few rare dates, the condition or your coin greatly effects value. The impressive coin values for Bust Quarters are computed from dealer's price lists with various mark-up factors figured in. They reflect closely the value you would expect to receive when selling. Variations in value do occur subject to subtle grading points, collector demands and dealer needs. For additional reference... NumisMedia publishes an extensive fair market value price guide, covering retail Bust Quarter values in detail. Bust Quarter values quickly rise as the condition of your coin improves. The less wear the more appealing and the more your coins are worth. Although rare dates are very valuable, they are rarely encountered. You stand a much better chance of higher values by having a better condition coin. The earlier Draped Bust Quarters are a prime example, $277 in "Good" condition, rising quickly to over $457 in the slightly better "Fine" condition. Compare your coins to the grading images below and then... check the values on the charts. The more detail showing in Liberty's hair and in the Eagle feathers puts a coin closer to the more desirable "Fine" condition. Should all the design appear sharp and crisp, you have a valuable bust quarter in "Extremely Fine" or better condition. If your coin is in the Extremely Fine or better condition, you have a highly desirable and valuable coin. Use caution here, a small degree of difference in appearance has a big impact on bust quarter values. Let the experts help. Check a few rare coin dealer's listings, looking for those offering Bust Quarters for sale. Their listings and prices usually include a notation of the NGC or PCGS assigned grade. Additionally... these coin dealers are potential buyers of your coins. Unlike the prominence of a rare date, a "condition rarity" is something that takes skill to detect. The grading images provide a basic understanding. However, there are many subtleties involves in determining the exact grade of your bust quarter, or any coin. In the higher grades especially, when a small difference means a large increase in value. When the stakes are this high, rely on the skills of the grading services. Visit a few coin dealers sites, compare your coins to those offered for sale. The descriptions indicate exactly the traits necessary for higher bust quarter values. Perhaps consider your coins as the beginnings of a collection. If not, one successful approach is to sell all your coins and use the proceeds to purchase one nice rare coin... the one you where hoping to find in the box. Pass the thrill of a rare and valuable coin on to your children. Never standing still, bust quarter values from one year to the next are always changing. They may fluctuate up or down but over the long term, the trend is up in value. The Draped Bust quarter variety is hugely popular, with strong demand and values. The Capped Bust quarter variety is more easily obtainable with more moderate values. Both are very collectible and treasured. Keep in touch with coin values, return here whenever curious and update your bust quarter values. Easily find how much your old coins are worth. From Bust Quarters to Seated Liberty, Barber, Standing Liberty and Washington quarters. All series include Grading Images to judge the condition and coin value charts. Print the Coin Values Worksheet - link in navigation column - to list your Bust quarter values. Should you decide to sell... use the worksheet as an invoice and packing slip when sending coins through the mail to dealers. It indicates you have done your coin values homework.